I awoke before first light to a cool north breeze, which had me putting on my down vest and knit cap, before heating water for coffee on the camp stove. Coyotes near Banta Shut-in to the east eerily announced their presence as the first cup was poured. I was thoroughly enjoying the experience and time with no human sounds to interfere with those of nature around me, loving how my soul is energized by moments like this. As the predawn light slowing started invading the night from the east, nearby day residents started making themselves known as songs and the sound of wings fluttered from bush to bush nearby drew my attention. A striking “char” “char” “char” “char” song gained volume from different locations around camp. 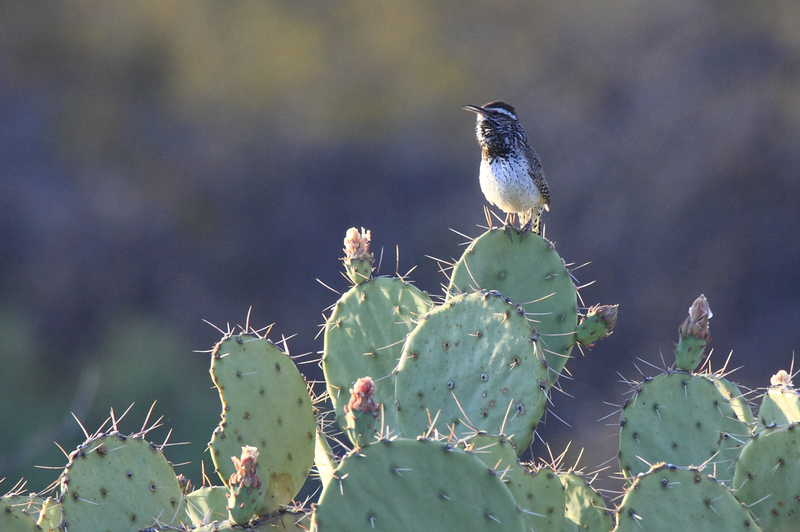 A Cactus Wren flew in closer and landed on an opuntia pad, giving me a front row seat to the concert. 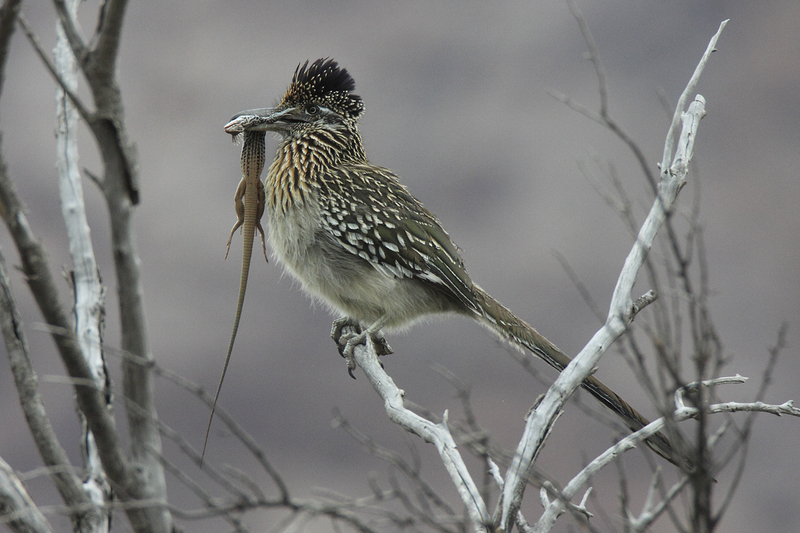 Here is a short video by Stoil Ivanov shot at Big Bend in 2014 for those interested in hearing the song of a Cactus Wren. After stashing some of my gear in the bear box, every campsite in Big Bend has one, I loaded up and headed to Dugout Wells, a small oasis surrounded by desert, that draws wildlife to the water and shade. On previous visits, I spotted two new to me birds while hanging out there during the heat of the day. Once there, it was shocking to see to see how bad it looked. The windmill was no longer running and most of the larger trees were dying , hardly looking like it did in 2012. It was disappointing on a number of levels. Why did the park service let it go? It’s very easy to get to for older folks and non hikers, and shaded, making it ideal for those that want to see birds without a lot of physical effort. Disappointment soured my interest in staying, so I headed down to the green belt between RGV and Daniels Ranch to see what was going on. 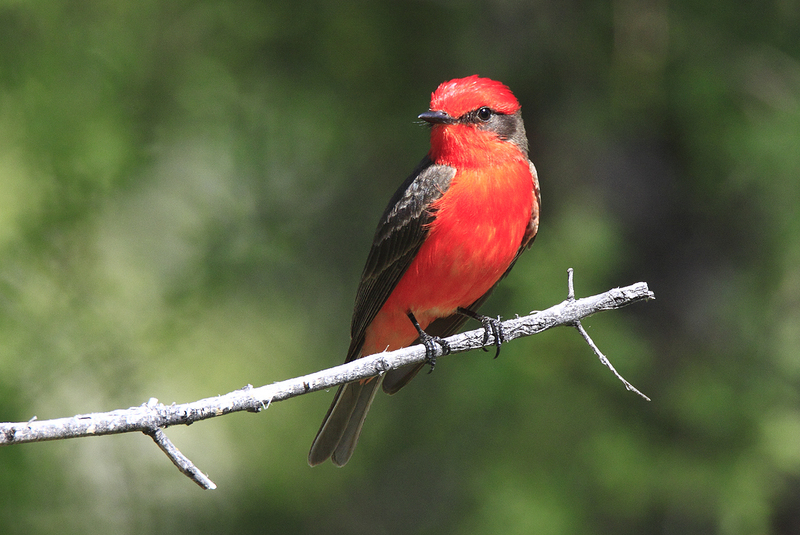 I got a nice pic of a Vermilion Flycatcher. 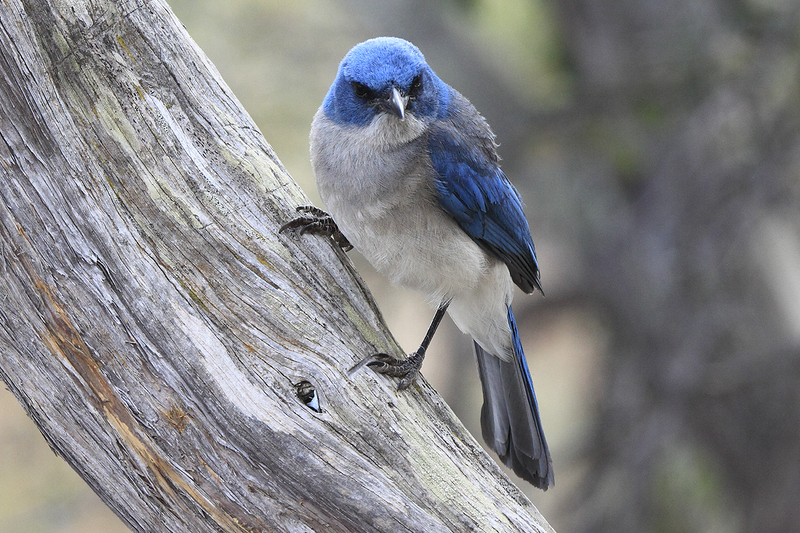 They love to use low hanging branches as a perch to make a quick flight to catch flying insects. Their behavior reminds me of the Eastern Phoebe that nests at the house each year. I dropped by the porch at the Rio Grande Village store, to sit and listen to other visitor’s adventures, and use the WiFi to check weather. I met a couple that had just backpacked the rim in the upper Chisos. I asked about water in Boot Canyon. They were told by rangers there was none to be had and to carry all you need. I heard the same thing again a few minutes later from someone else. Based on that, I decided that my over-night backpack trip planned to photograph Colima Warblers would become a day hike instead. I didn’t want to carry over two gallons of water, camera gear, food, tent and other goodies to the rim, so I drove over to the nearby RGV Visitor Center and changed my itinerary. With cell service almost non existent in most of the park and my wife loving the idea of being able to communicate with me text wise in the evenings at K-Bar, I asked they just put me there the rest of my stay. 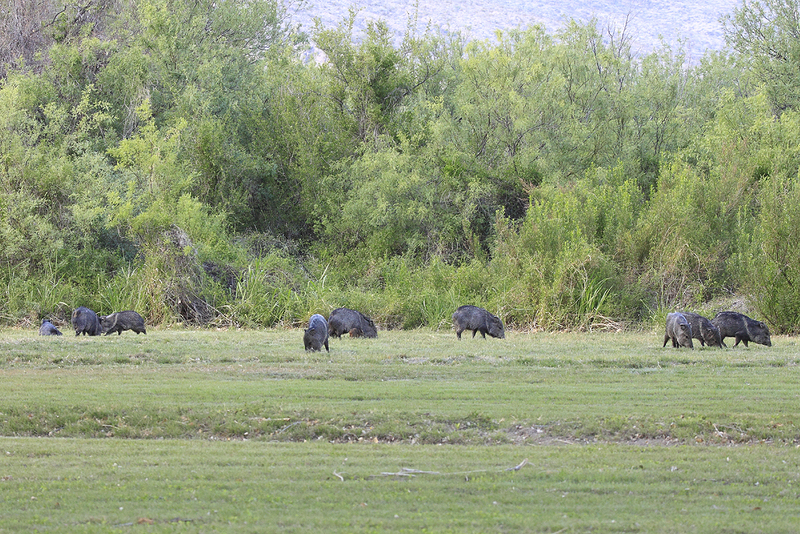 Towards evening on the greenbelt I saw the javelinas, roadrunners, and a few other birds. But I really wanted something different, so I went easy on the camera batteries. Got my shower at the RGV store, then made the drive back to K-Bar. Once there I put up my tent, got out the camp chair and a beer, then enjoyed another beautiful, relaxing evening. Day 3 in my mind, at the time, was the make it – break it day of the trip. The peak of the bird migration was why I came at the end of April. 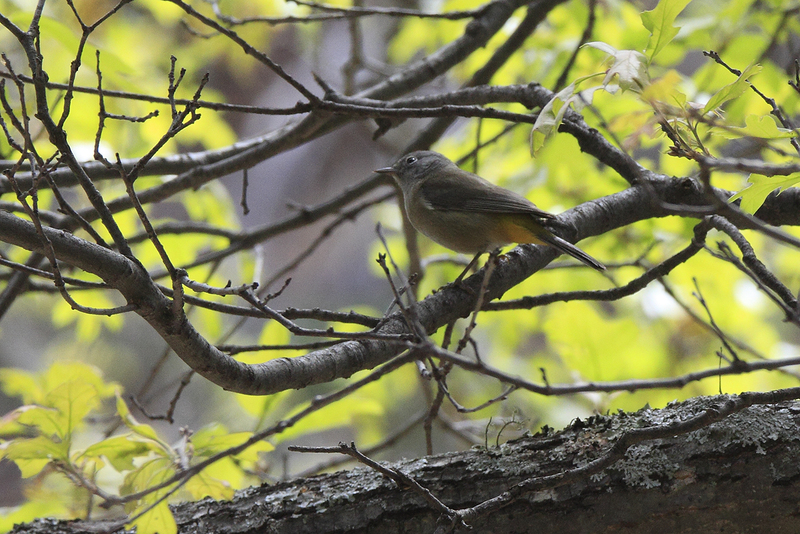 And the main reason was to photograph a Colima Warbler, the holy grail of birding in the United States. I left camp around 7:00 am and headed to the basin. My Osprey Exos 46 weighed 20 lbs with snacks, 4 liters of water and camera gear. I started the Ramblr hiking app on my phone at 7:55 am when I stepped onto the trail head leading to the Pinnacles Trail. From the basin trail head to the top of Pinnacles Trail is roughly a 3.5 mile hike with 1,600′ of elevation gain. I was really worried about what kind of shape I was in because of recent upper respiratory infection that kept me from working out for over a month. I was in shade most of the hike up the mountain by starting that early. Near the top, it started getting slightly overcast and really cut down on water consumption. 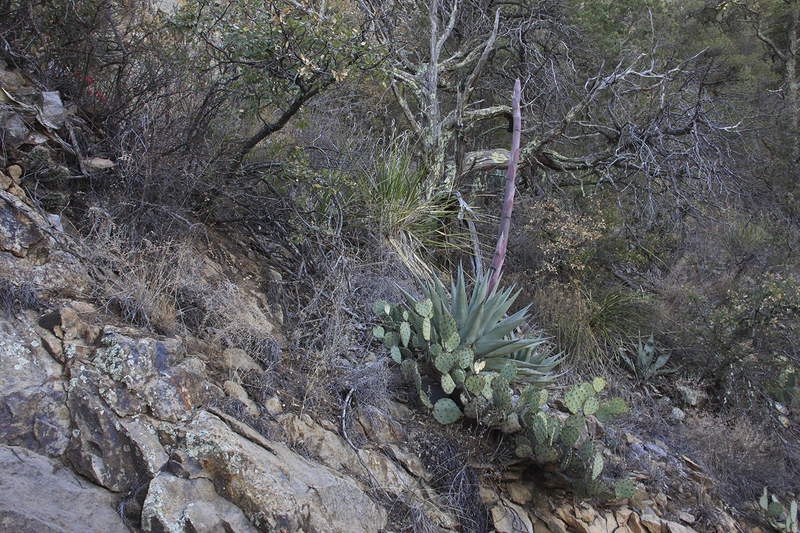 I stopped to take a pic of this agave bloom spike just below the bear boxes. I made it to the Emory Peak bear boxes at 9:59. I dropped my pack, then pulled out the 150-600 mm lens and monopod and stuck the little landscape lens in the pack. There were 4 hikers sitting at the bear boxes eating snacks and being harassed by Mexican Jays demanding their fair share. 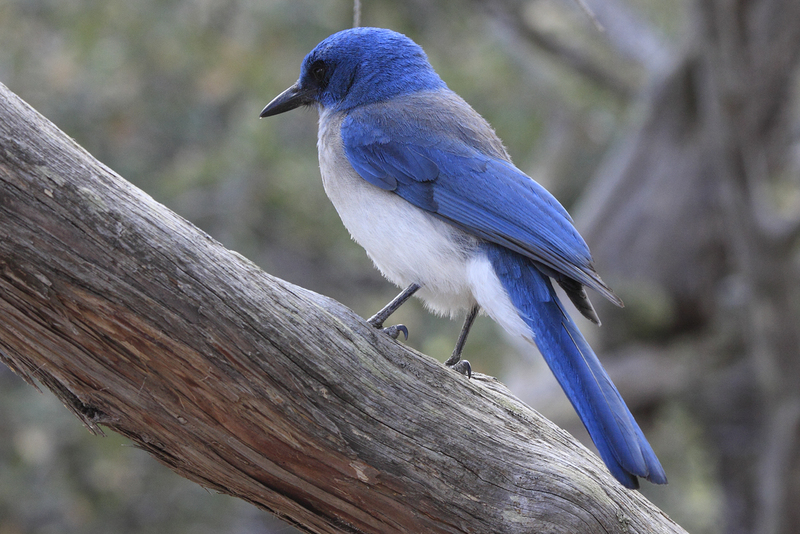 The only place in Texas you have an opportunity to photograph a Mexican Jay in habitat is the Chisos Mountains. I started a slow methodical hike from the bear boxes to the Boot Canyon Trail hoping to see or hear a warbler on the way to Boot Canyon. A few minutes later a birder showed up and told me about a report she had from the day before of Colima’s at Boot Canyon Spring and invited me to tag along. Once there at the spring below the two buildings, we both heard Colimas singing. Over the next 3 hours I saw a bird 8 times come through the area. Only twice did I hear it coming in. The other times I just spotted one in the tree. Overall I was happy to see a very rare bird, but very disappointed in getting any pics. They’re small, move fast, and tended to like the tree with the most foliage. 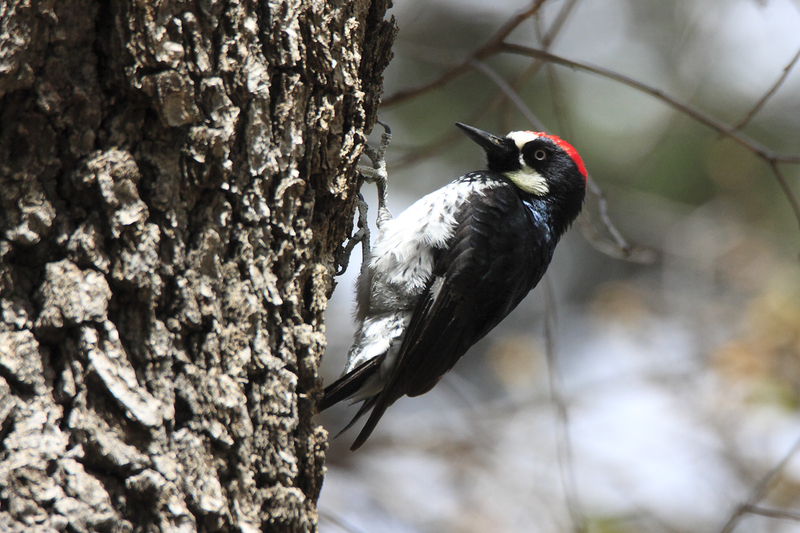 One bird in the area easily seen was the Acorn Woodpecker. They were noisier than the jays. After 3 hours I started noticing it was getting cloudy. I wasn’t having much luck with the warbler, so I packed up and headed to the Colima Trail. About midway on the Colima, I could see dark clouds to the west. By the time I got to the Laguna Meadow Trail, I could see lightening and the thunder was loud. One thing I forgot to put in my pack was a rain cover for it and the thought of wet camera gear was becoming a concern. I wrapped my camera with an extra shirt, stored in the pack, and then set a fast pace down the mountain. It sprinkled on me 3 different times down to the basin. About 100 yards from the trail head, I heard a roadrunner calling. 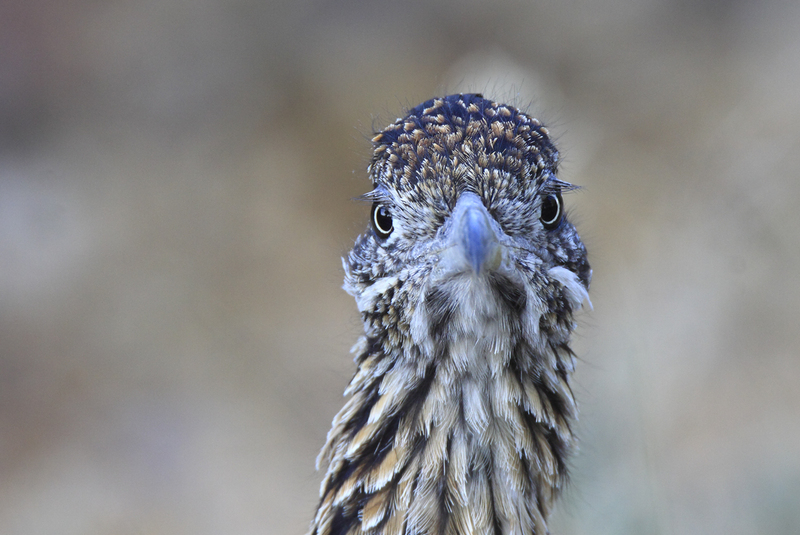 OK, this is a bird I shoot at home all the time, but there is no such thing as too many roadrunner pics. I pulled the camera out of my pack and took a few shots before heading to the Uplander. The early Spanish explorers called it El Despoblado, the uninhabited land. My first trip there forever stirred my soul. This country boy raised in the rolling hills of Oklahoma fell in love with everything. A desert landscape dominated by ocotillo, cactus, yucca, and cresote. 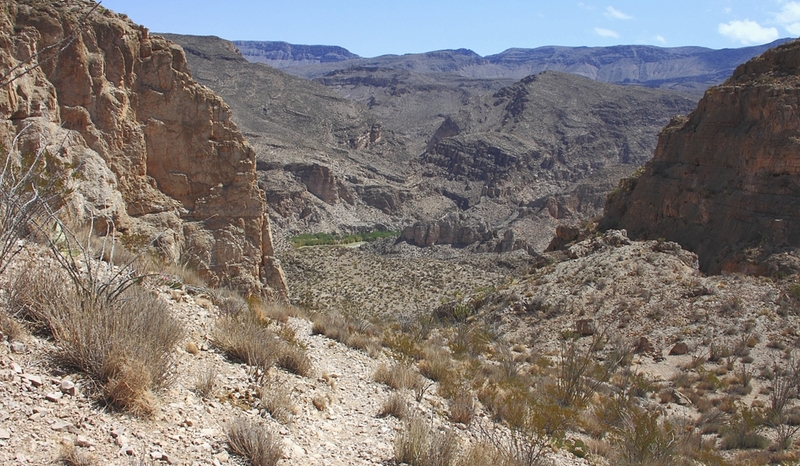 The lush green growth along the Rio Grande as it flowed through massive canyons along the border. 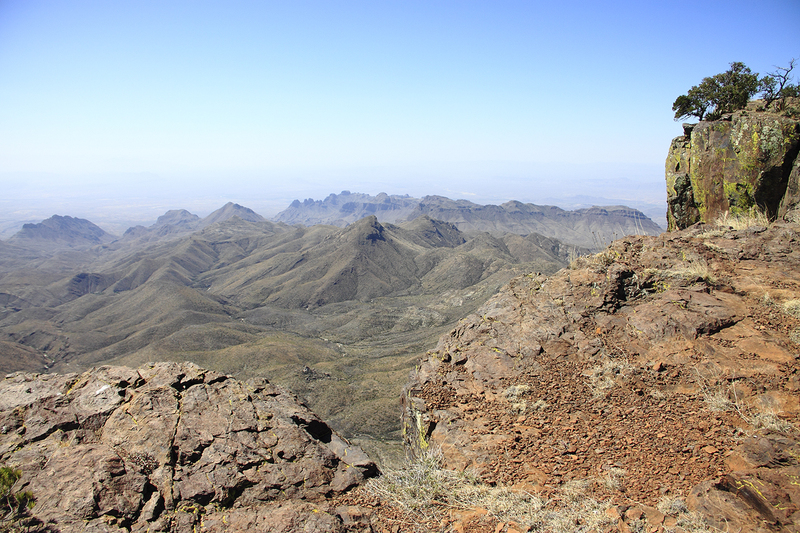 And the majestic Chisos Mountains in the heart of the park covered in a oak and pine forest rising up over 5,000 feet in elevation above the river with the incredible views from the rim trail that took me to a another time and place dominated by the refreshing feeling of solitude. 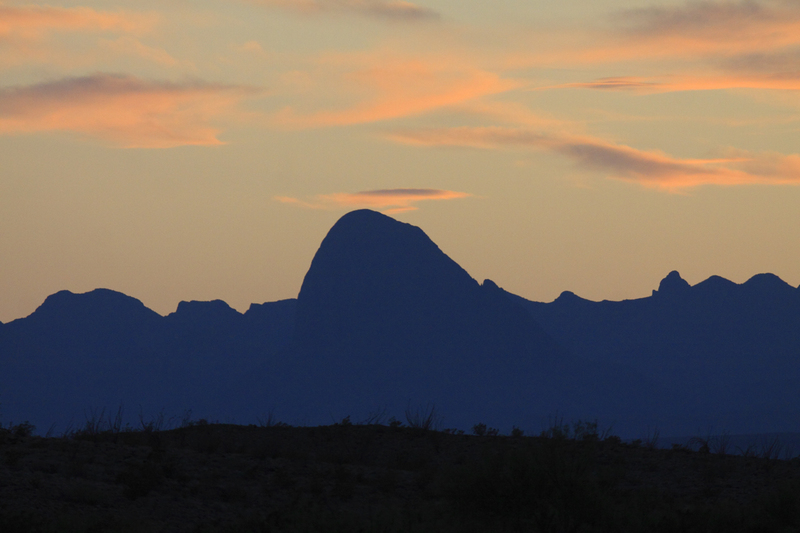 The first evening, I camped in a primitive site north of the Chisos. After spreading out a tarp on the Chihuahuan Desert floor in the fading light, I lay there soaking it all in as the landscape came alive with the sounds of life emerging from burrows and shaded places. Countless stars dominated the night sky from horizon to horizon, brighter than any full moon back home. It took me back to my youth in the 60’s, before we became afraid of the dark and other people, and put light poles and security lights everywhere. 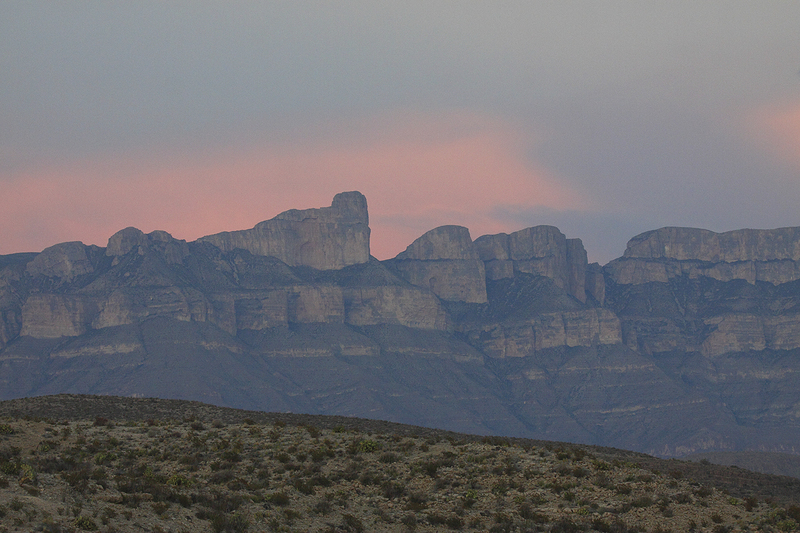 I knew from that night on, visiting Big Bend would not be a one time event, but the first of many to follow. My return trip was just as amazing as the first, spending a few days with friends exploring and hiking. We backpacked the Marufa Vega Trail, but because of the heat, conditions were not ideal. The last mile of the trail where the elevation dropped an incredible 1000 feet down to the river was definitely a highlight! However, my trip was cut short by a gash in the sidewall of a tire. Big Bend is not a place to be driving without a spare because of it’s isolation; but that is one of the things that draws me here. The plan for the next trip will be two spares instead of one. This trip was for the birds! Through research, I discovered that Big Bend is one of the best places in the United States to photograph them. More than 450 species can be found in the park throughout the year, with the peak being the northern migration the last week of April. 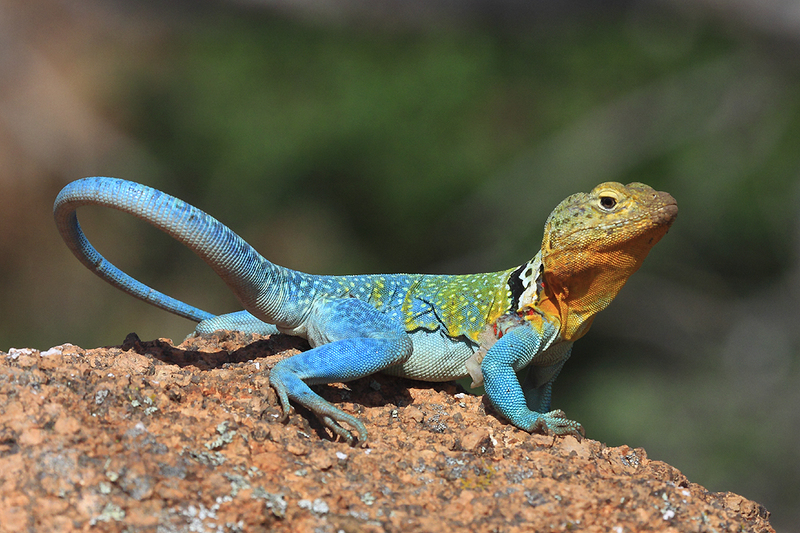 My previous trips were in early April to see cactus in bloom and photograph reptiles. It’s hot in early April, add another two weeks and the comfort level is almost intolerable in the desert sun. Staying in shade as much as possible, wearing baggy light colored clothing, and a lot of water is a must. 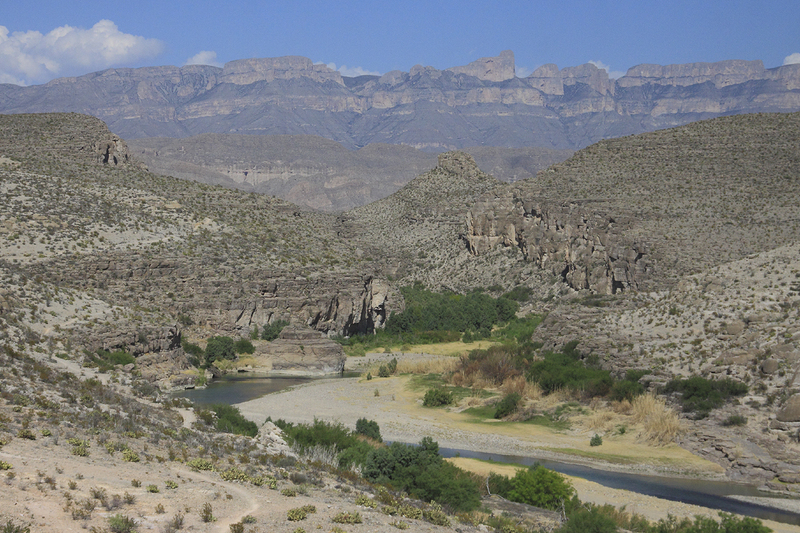 People die in Big Bend because of the lack of respect the desert deserves, over estimating their experience, making bad choices, or being unlucky. The park service shuts down the Rio Grande Village Visitor Center for the summer on the 1st of May because of extreme temperatures along the river. The night before, I loaded everything but the ice chest into the Chevy Uplander van, in anticipation of an early start. I rarely sleep well before a trip and wanted to take advantage of that, by getting to Big Bend early in the afternoon to reserve a primitive desert campsite and then scout around. Although I’ve stayed in the Basin Campground in the Chisos Mountains before, I prefer an isolated campsite away from the crowd. Driving 10 hours one way to have another campsite ten feet away from my tent is not on my to do list. I arrived to the park at 3 PM and the window at the entrance had a sign stating both the basin campground and lodge in the Chisos Mountain were completely full. Although I wasn’t heading that way, it signaled there were a lot of people in the park. I used my volunteer pass for a free 10 day stay and reserved 4 nights on my back country pass at Panther Junction. Pulling up to the stop sign in front of the Rio Grande Village (RGV) store reinforced the feelings of a crowded park. The RV hookup area was full and the wifi access porch on the side of the store was packed with bikers enjoying the shade, cold drinks, and ice cream bars. I turned right and slowly drove toward Daniels Ranch which was at the end of the road. The area near Daniels I like to call the greenbelt, because it has an irrigation ditch traversing through it, and a park like setting that seems out of place in the desert, but makes it ideal for seeing birds and wildlife. As I was driving down the road, an angry bird approached the vehicle. Nothing of interest caught my eye at Daniels, so a short drive to the Hot Springs District and a hike down the Hot Springs Trail provided me with a nice shot of the Sierra Del Carmen with the Rio Grande in the foreground. 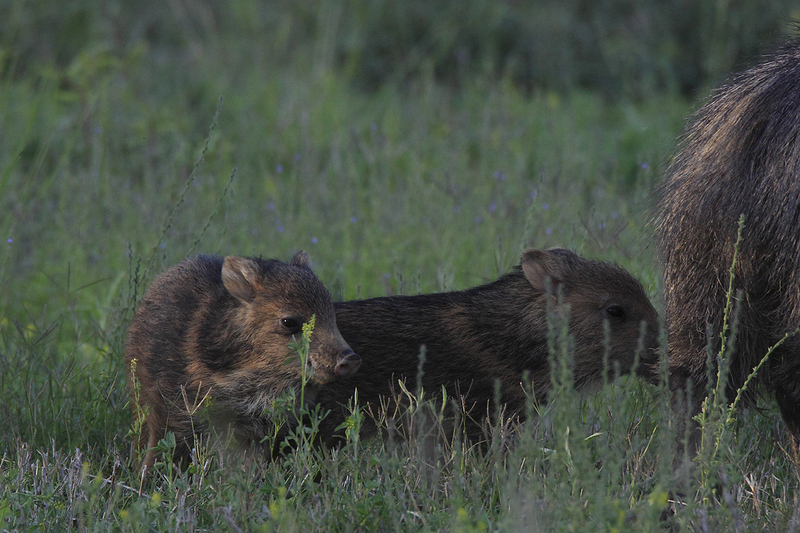 Driving back to the greenbelt provided me with an opportunity to shoot a family group of javelina consisting of 9 adults and two piglets. After getting out of the Uplander, I spent about twenty minutes putting myself in a position where they would cross my path, then I backed up against a large tree and waited. They got very close, leading me to believe their eyesight isn’t a strong point, but I did see them frequently raise their snouts into the air to check the wind for scent. The sow with the two piglets stayed the furthest from me by hugging the tree line that borders the northern edge of the greenbelt. 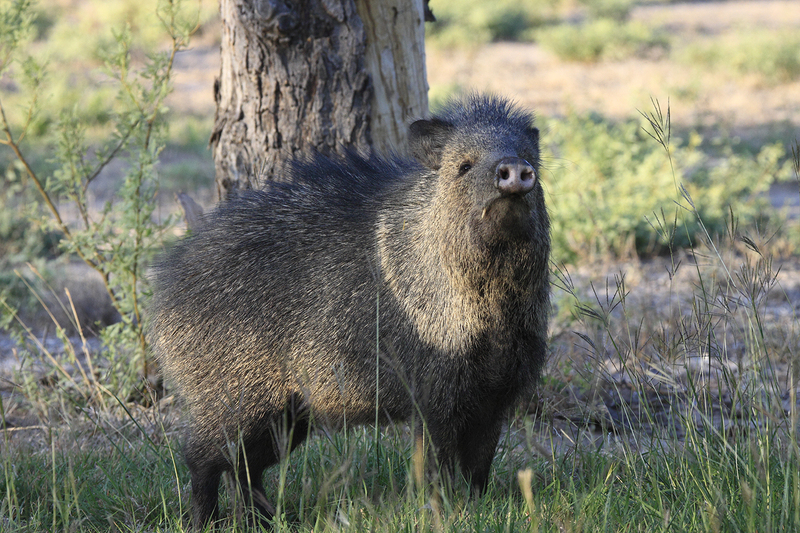 I was covered in sweat by the time I got back to the Uplander, in spite of staying in the shade of the trees while stalking the javelinas. It had finally cooled off enough towards sunset to take a shower at the RGV store and drive to camp. I stopped along the way for a couple hand held shots of the landscape with the 150-600 mm lens, mainly because there wasn’t time to switch lenses and get out a tripod. After arriving at K-Bar 1, a primitive campsite east of the Chisos Mountains, I dug out the camp chair to take in the spectacular transition of day to night. A cold adult beverage and the sounds of nature had a relaxing, calming effect after a long day of driving. A notification from Sky Guide, an app on my iphone, alerted me that the International Space Station was about to fly directly overhead, a subtle reminder that I’m not as far off the grid as I thought. After a few texts back and forth with the wife to let her know I was OK, it was time to drag out the sleeping bag. Throwing a tarp on the ground and sleeping under the stars was the plan, but the Kangaroo rats hopping around under foot wouldn’t leave me alone. Being tired and not wanting to pitch a tent now, I ended up clearing enough space in the Uplander and slept there. 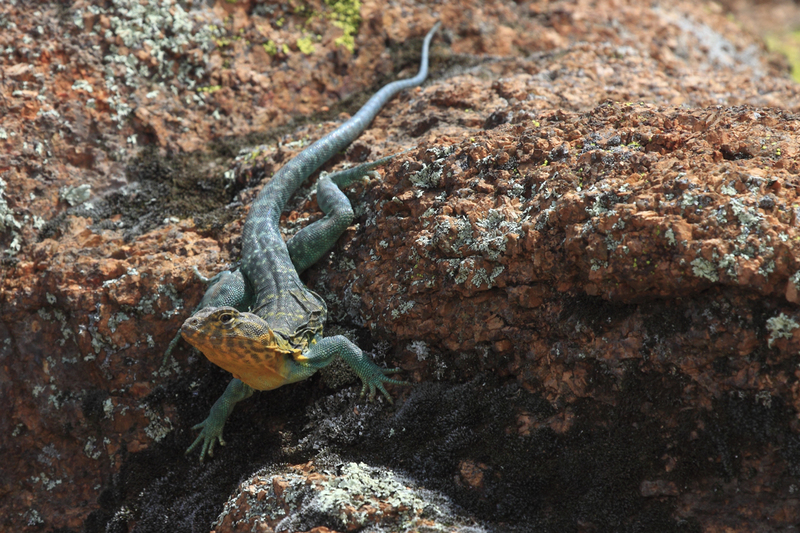 Anyone that has spent time hiking during the spring or summer at the Wichita Mountains Wildlife Refuge has probably encountered our state reptile, The Collared Lizard or Mountain Boomer, on the trail. The male looks more like a tropical species than something you would find jumping from boulder to boulder in southwestern Oklahoma. Stopping for a few minutes to watch their antics can be very entertaining. Males can be very demonstrative, especially during the mating season. 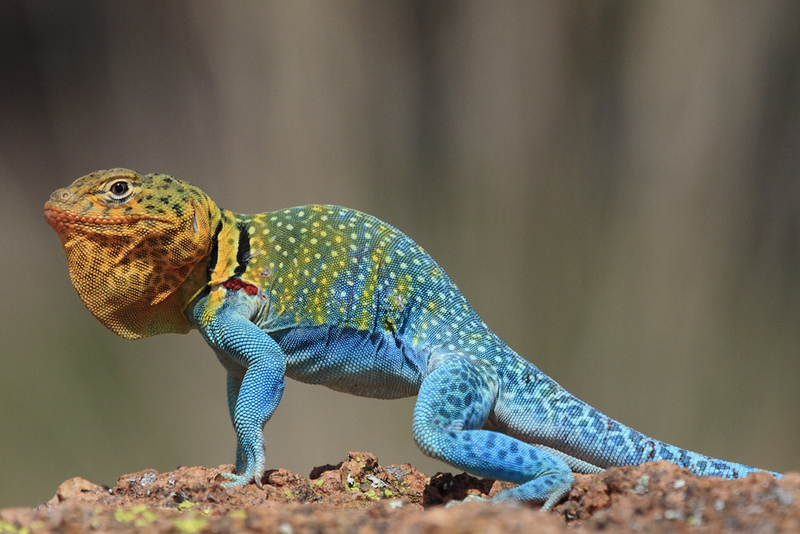 As I wind down the winter from photographing elk, whitetail deer, and river otters, I start looking forward to spring and collared lizards coming out of their dens. Early in the spring they look very lean from weight loss over the cold season. Some of my best photographs of boomers were in May and June. They have been able to put on a little weight and shed their old skin from the winter. 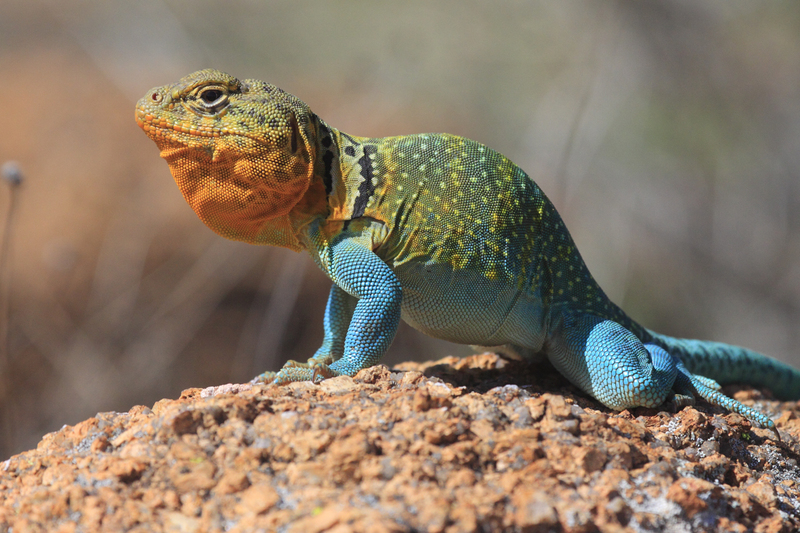 Both male and females have a beautiful bright color for the mating season. The male especially can be very demonstrative as he tries to attract a possible mate. I have often been entertained by male mating behavior for hours. He finds a high spot where the females can see him, puffs up and lowers his beard to look larger, and then prances around on the rock. Once I saw a male going up and down on his front legs as if he were doing push ups! 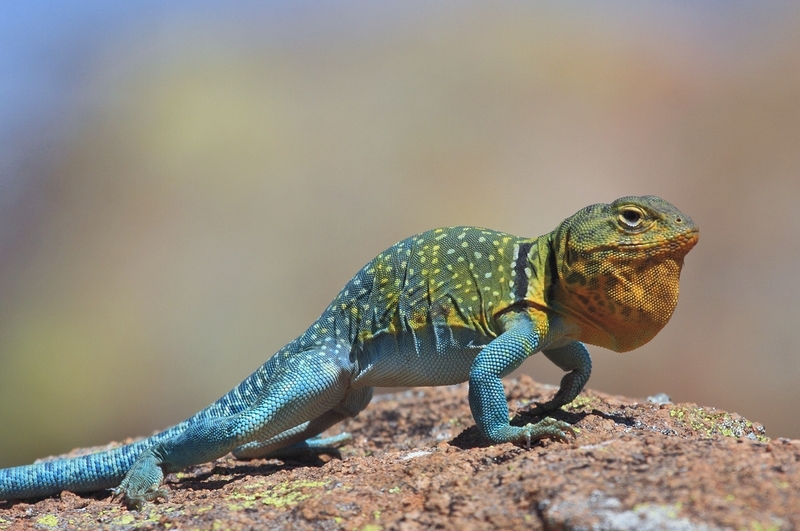 When photographing, I always try to find a position where I am lower than the lizard so I am less intimidating, and they don’t feel the need to run away or go underground. I also like to have the sun at my back to get eye shine. This is difficult because of the bone structure over their eye, so it helps to have the sun low on the horizon. If you are successful at becoming part of the landscape and not influencing behavior too much, you may even get to experience a little interaction between you and your subject. 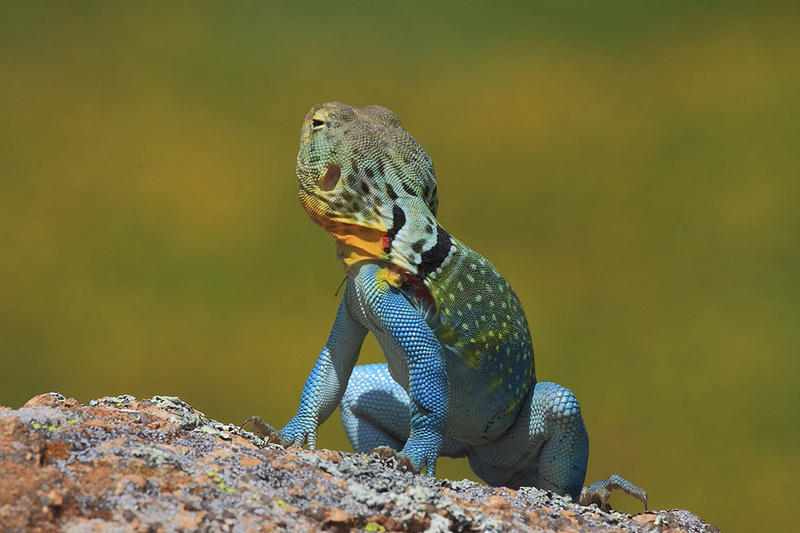 One method the lizards use to let you know you are too close is whipping their tail back and forth. They will also open their jaws and hold them open for ten to twenty seconds or more. 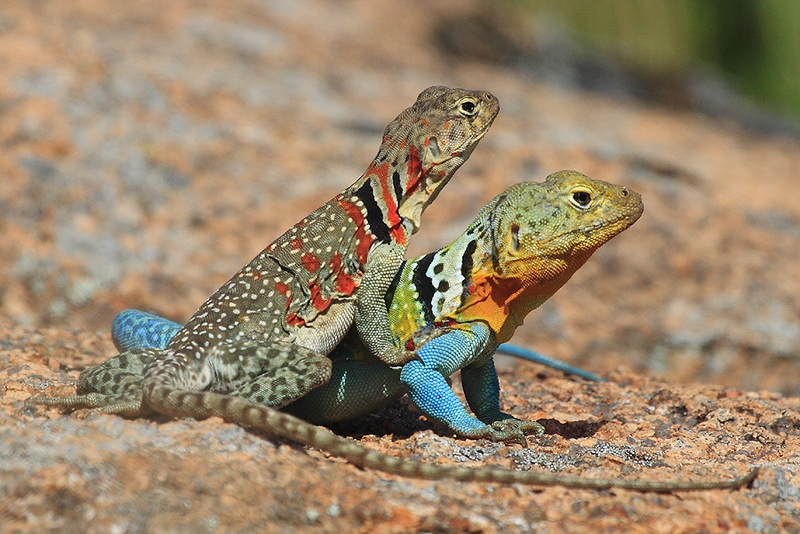 Mating is very aggressive by both the male and female. They will each get in a dominant position at some point in the sequence and wrestle. 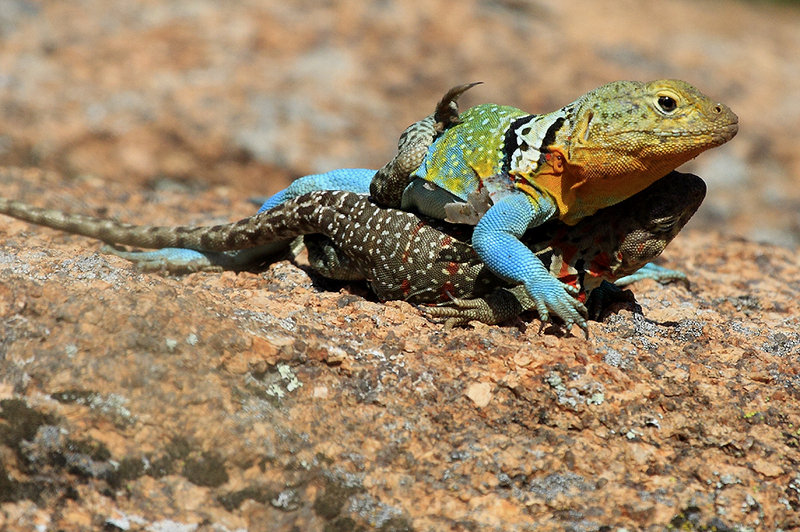 At the end of the sequence the male is on top. You may have noticed in 3 of the previous photos a male with a white tint around the back of his neck. He was a favorite of mine for two years, but I haven’t seen him since then. 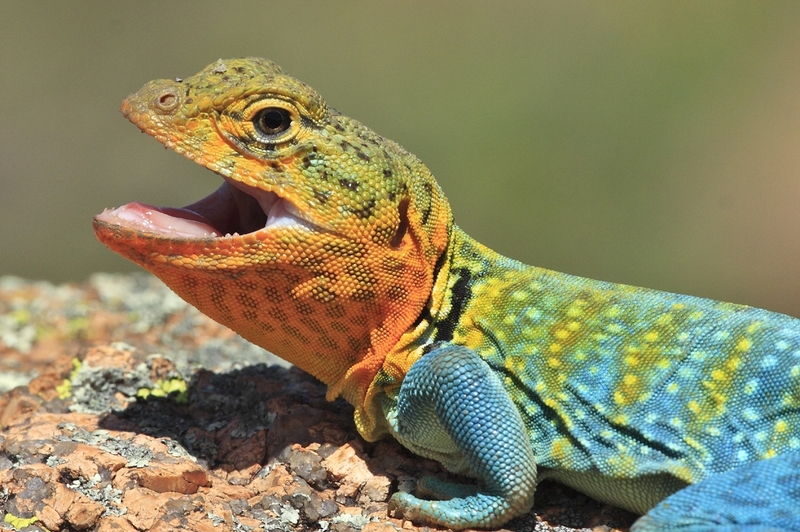 Being so colorful, in a location with a lot of potential predators, I suspect they have a short lifespan. I enjoyed the time I spent photographing him. I hope you enjoy my blog. let me know what you think. 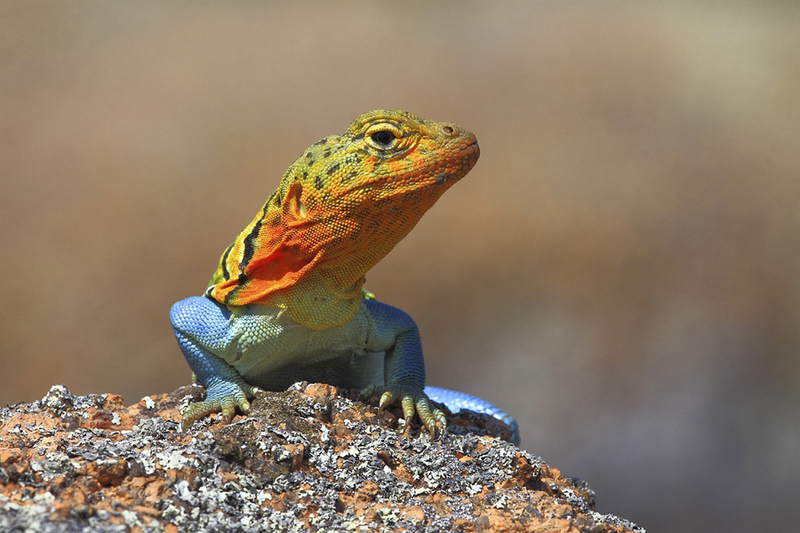 There are two times of the year I look forward to; seeing Collared Lizards out on the rocks again in the spring, and elk rut in the fall. 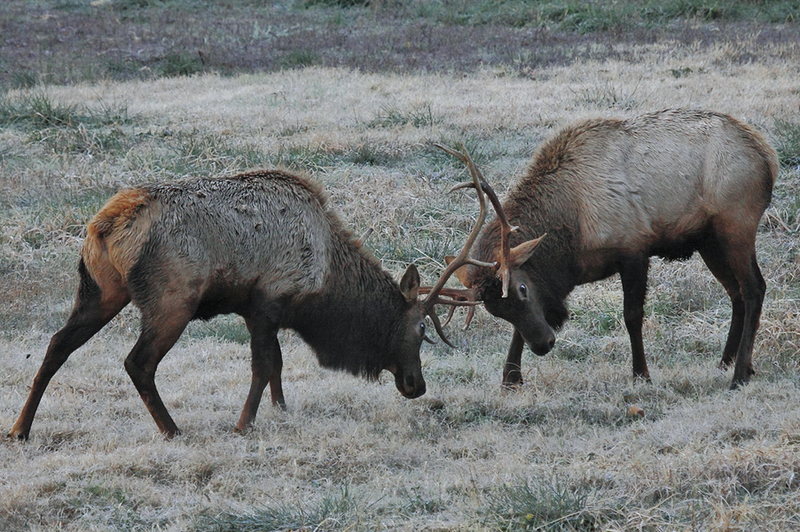 That first trip down in late August, when the bulls start bugling gets me excited. I can’t wait to hike into one of my favorite places to shoot the rut. 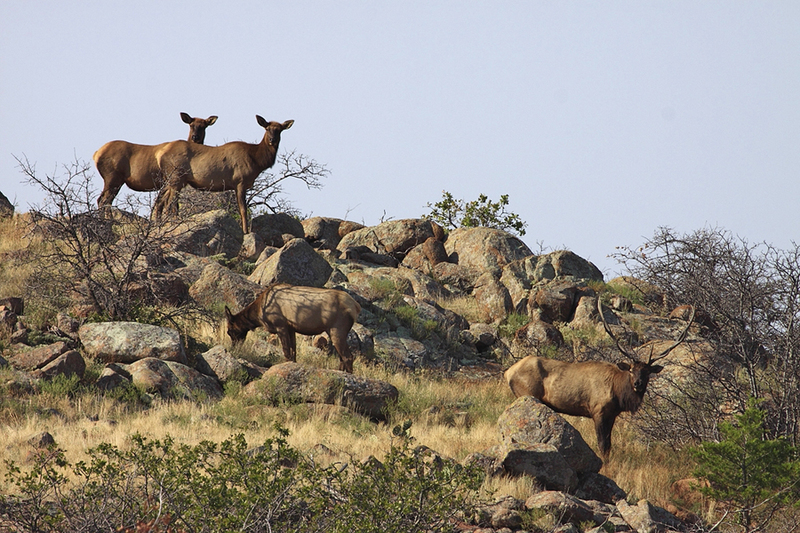 The Wichita Mountains was originally home to the Meriam Elk, but that species was hunted heavily and became extinct in 1881. 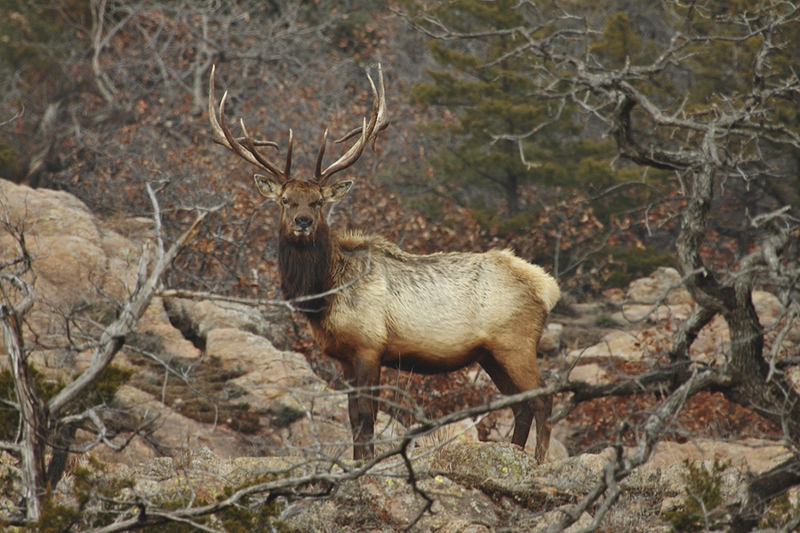 The first Rocky Mountain Elk were introduced into the Wichitas in 1911 from the Teton National Forest. More came from Jackson Hole Wyoming in 1912. These were the seed animals to the large herd you find here today. On deer you count the number of points on both sides together calling the buck a 8 point, 10 point, etc, etc. 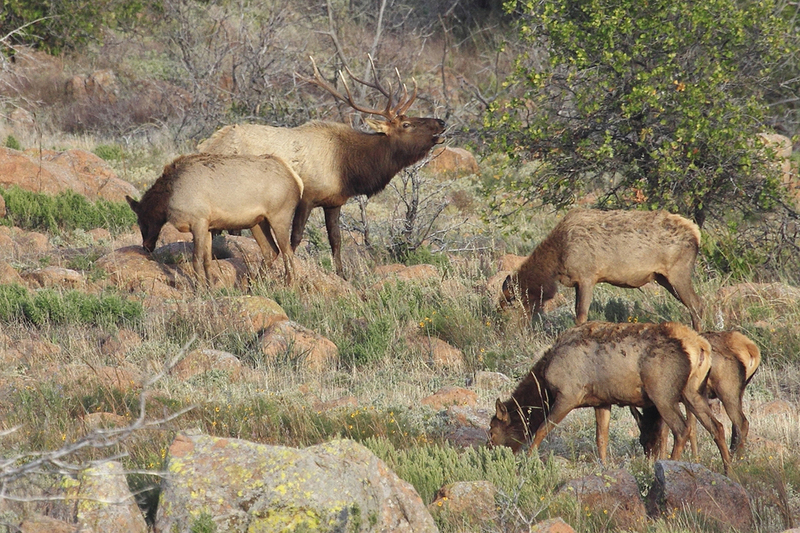 Points on elk are counted differently. The number on each side are tallied separately. So a bull might be a 5 x 5, 6 x 6 and so on. 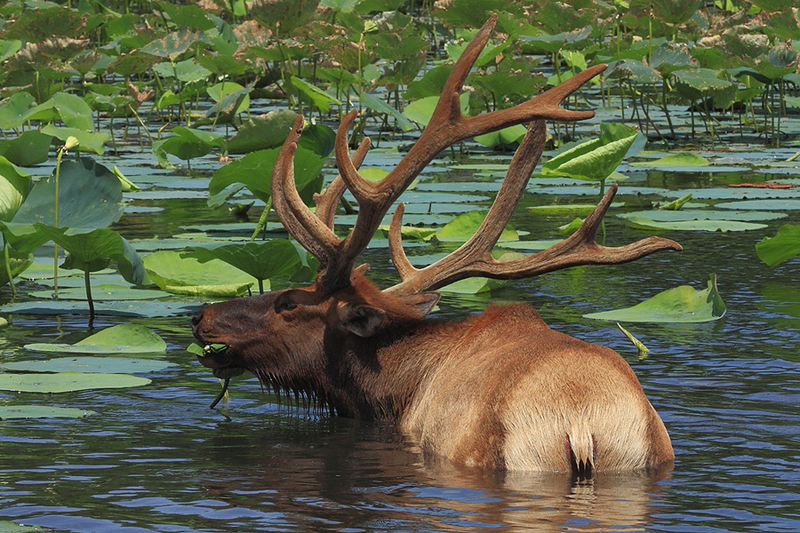 Bison and longhorns have horns, and horns last throughout the animal’s life. 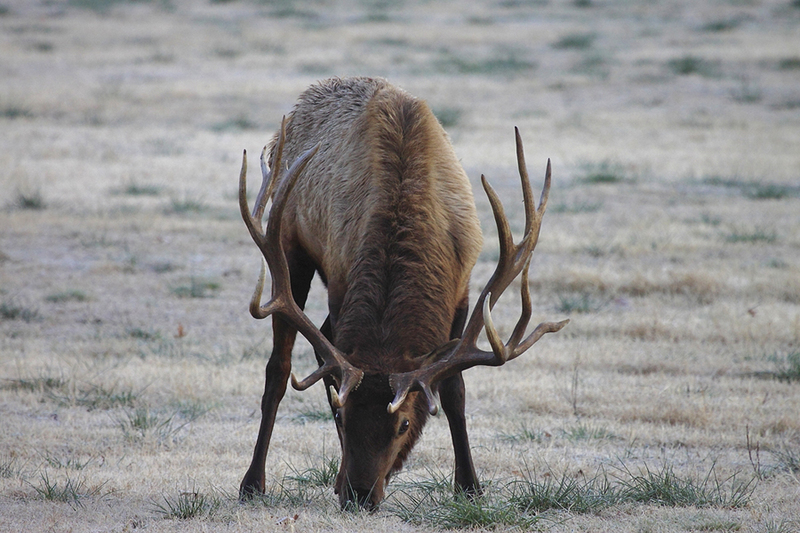 Male deer and elk have antlers, which are shed each year and regrow. 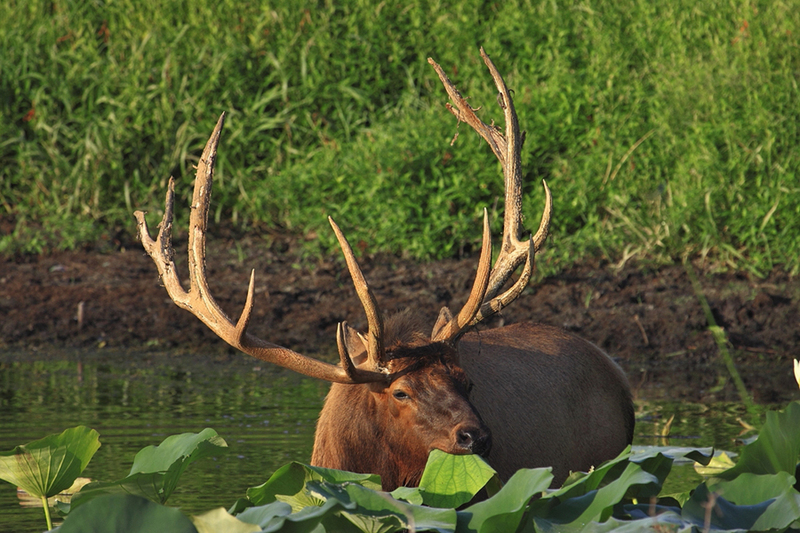 Elk drop their antlers in early spring and they grow through August. 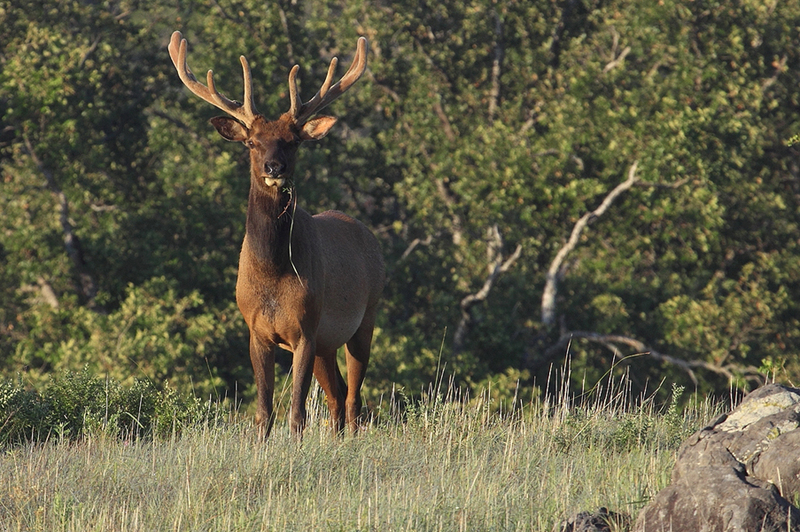 Elk antlers are the fastest growing animal tissue on the planet, some growing as much as an inch a day. By mid August the velvet protecting the growing tissue starts to dry out and the bulls rub it off and polish the bone underneath it. By the end of August a dominant bull will start gathering up cows into what is called a harem. He will spend the next two months constantly watching over them to mate with any cow that goes into estrous and to keep other bulls from stealing them away. He will rarely sleep or eat until the rut is over around the end of October. 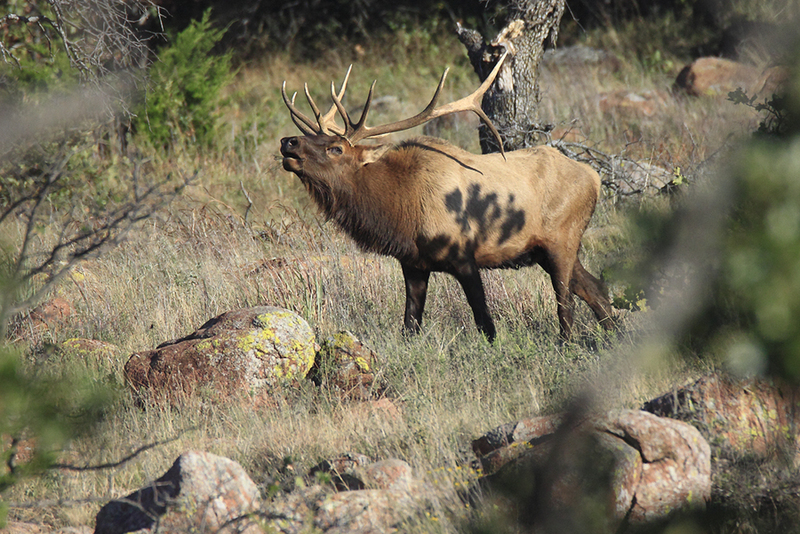 By the end of October the rut is over, and the bulls are exhausted. They leave the cows to rest and try to regain the weight they lost. I find bulls are a lot easier to photograph than cows and even more so after the rut. I think they’re just worn out and don’t want to run away. 🙂 Here are a few more of my favorite elk shots. I can still remember the emotions and excitement of the first close encounter with a river otter at the Wichita Mountains Wildlife Refuge. 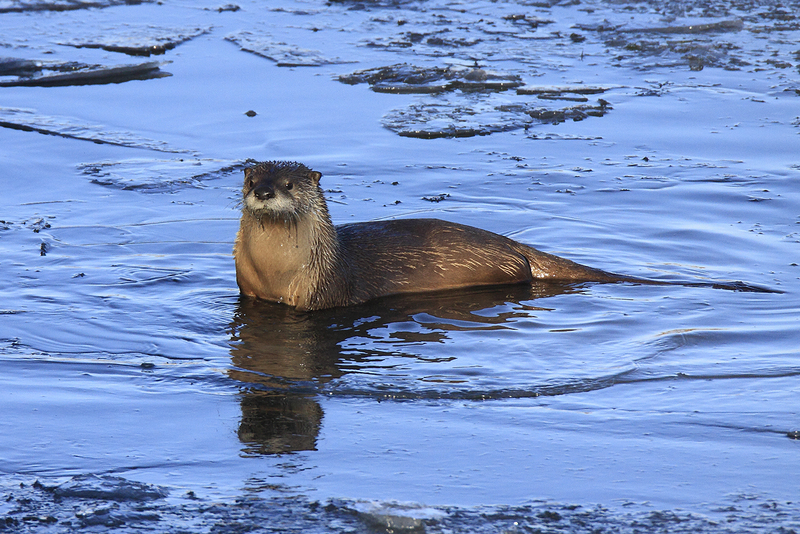 In early February 2012 I received a few reports from the staff about otter sightings at French Lake and the Fish Lakes. I spent a number of weekends and many hours hiking, sitting and hoping for that first good photo. Those 3 weeks of no results made that first encounter that much sweeter. This was a definite boost of confidence that I could accomplish any goal I set at photography. One of my historical heroes is Randolph Barnes Marcy. 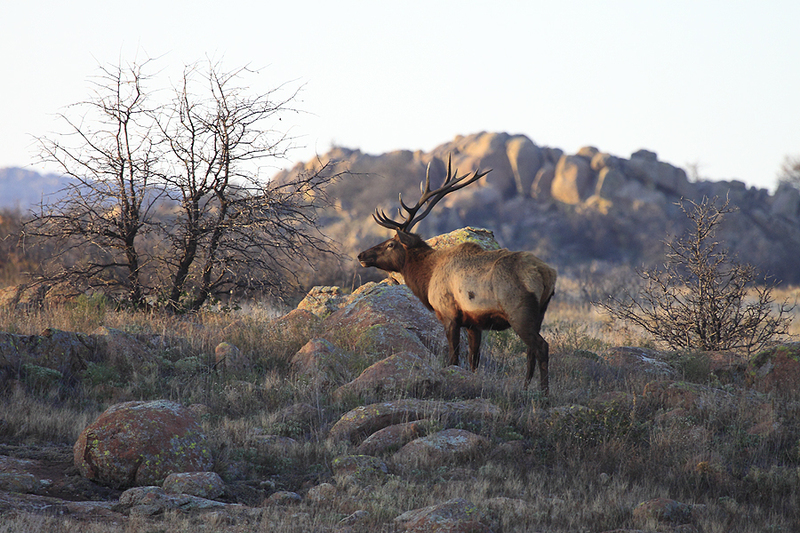 In the 1850’s, as a Captain in the U.S. Army he led an expedition through the Wichita Mountains. He was directed by Congress to “collect and report everything that may be useful or interesting”. 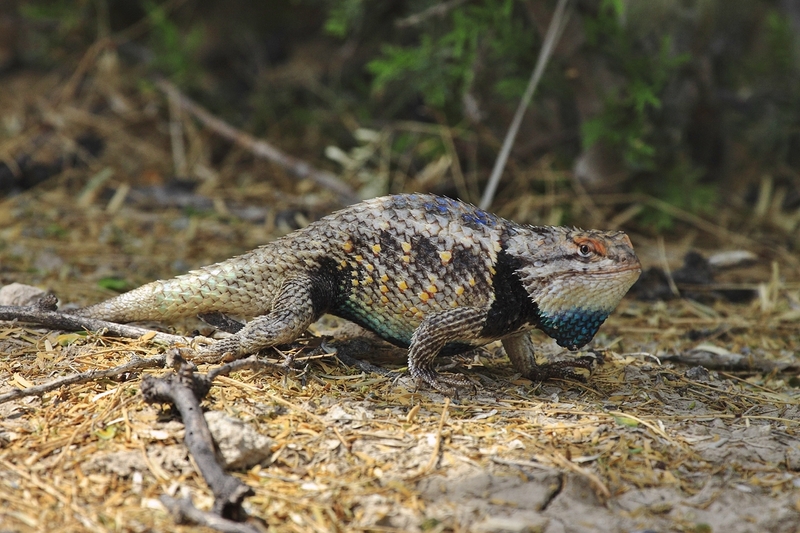 Between May 2 and July 28, 1852, Marcy’s party traveled over a thousand miles of previously undocumented Texas and Oklahoma territory, discovering numerous valuable mineral deposits as well as twenty-five new species of mammals and ten new species of reptiles. He recorded a prairie dog town that covered 400,000 acres. He also discovered the sources of both forks of the Red River which was the main objective of the expedition. Additional discoveries included the Palo Duro and Tule canyons which he became the first white man to explore. The expedition encountered and documented the little-known Wichita Indians and he compiled the first Wichita dictionary. On his recommendation a fort was established south of the Wichitas which later become known as Ft Sill. Captain Marcy named a number of mountains, including Mt Scott and Mt Sheridan in the Wichitas. He also named Otter Creek, which is believed to be under what is now Tom Steed Reservoir. 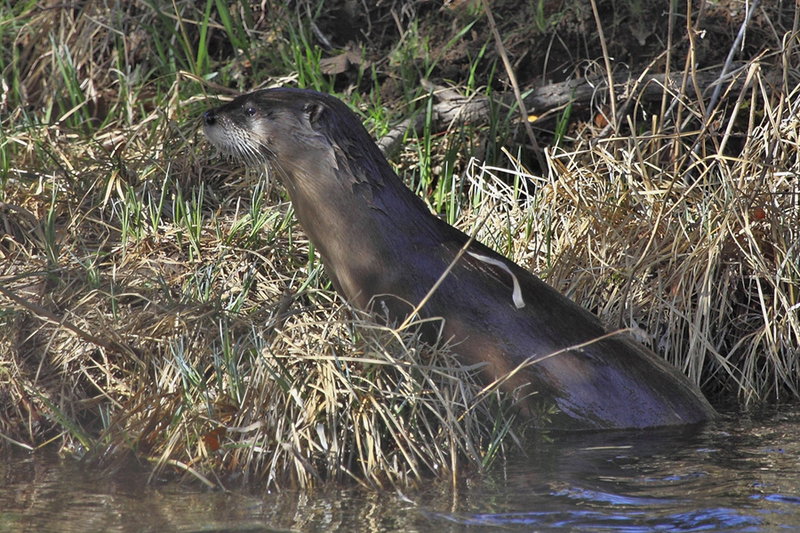 He mentioned seeing river otters in large numbers in the area. Historical records show that Native Americans in the late 1800’s traded otter pelts at Ft. Sill. 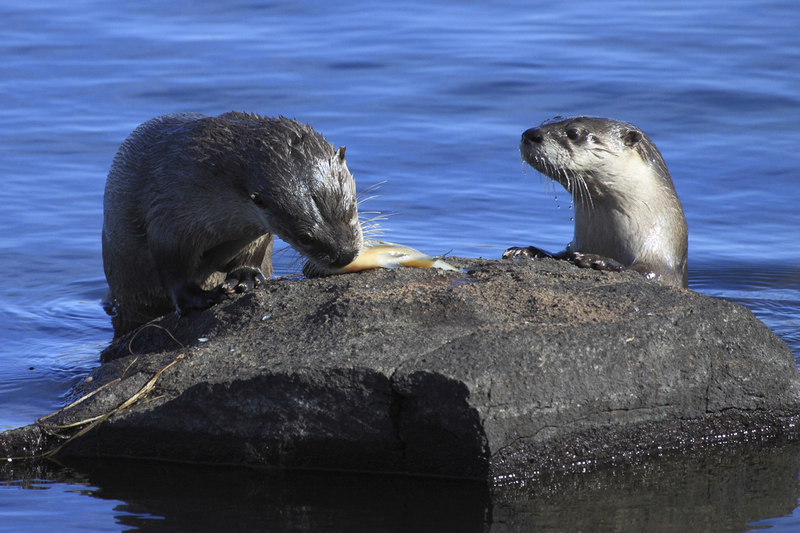 In June of 1997 then Refuge manager Sam Waldstein wrote the Fish and Wildlife Service requesting permission to reintroduce otters in the Wichita Mountains. He was granted permission in July to import up to six otters from the Bayou Otter Farm in Louisiana and to contact APHIS, the USDA Animal and Plant Health Inspection Service, about acquiring up to ten otters that would be live trapped around the Antlers Oklahoma area. 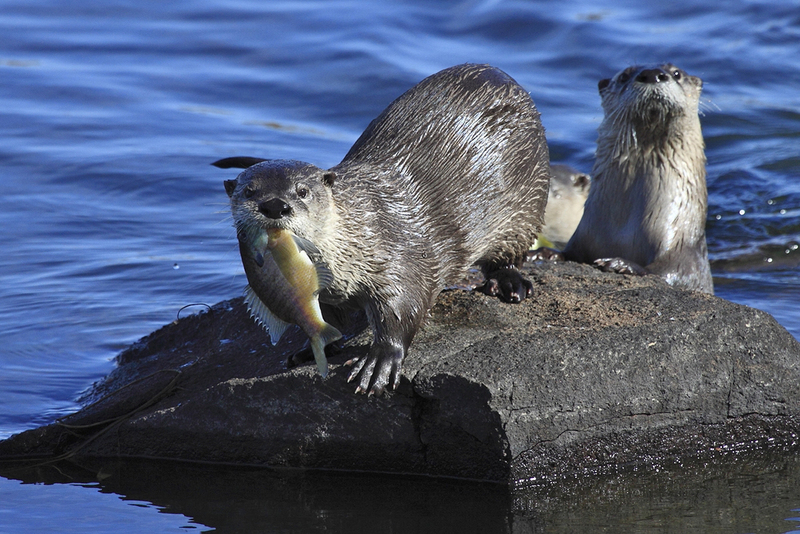 Over the next year eleven river otters were released in the French Lake area. 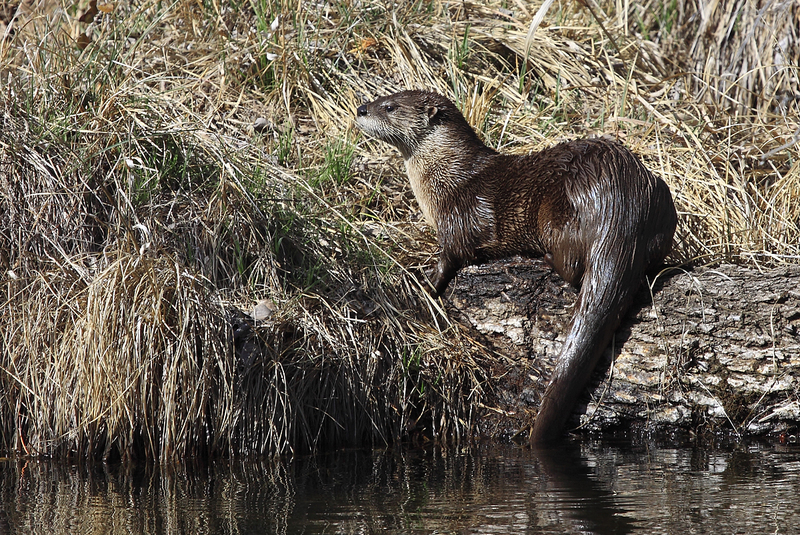 Otter sightings by the public were rare until early 2012. 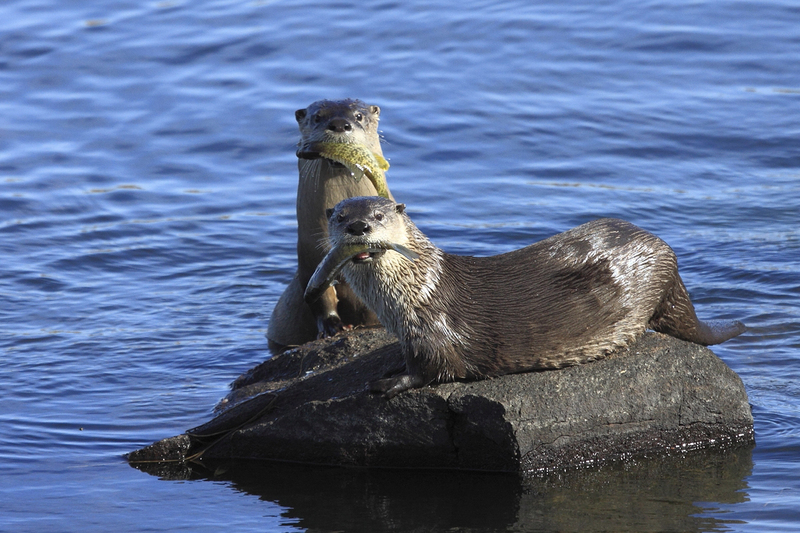 The number of otters are now up to the point they can be spotted in all of the lakes on the public side of the refuge. I’ve seen them in West Cache Creek, Caddo, Quanah Parker, Crater, Lost Lake, the Fish Lakes, and Burford Lake. I personally believe the best time to see them is winter, especially when the lake is iced over. 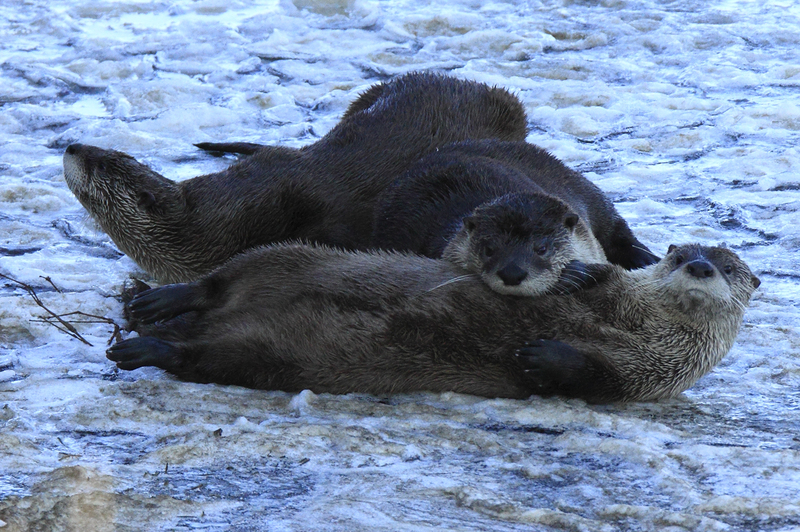 Otters tend to get in a lake and stay there until spring. The best time for spotting them is right at daylight and in the afternoon. On March 1, 2012 I parked at the lot on French lake and hiked past the dam into the Fish Lakes area. I spotted my 1st river otter after 10 minutes, slowly working its way downstream. 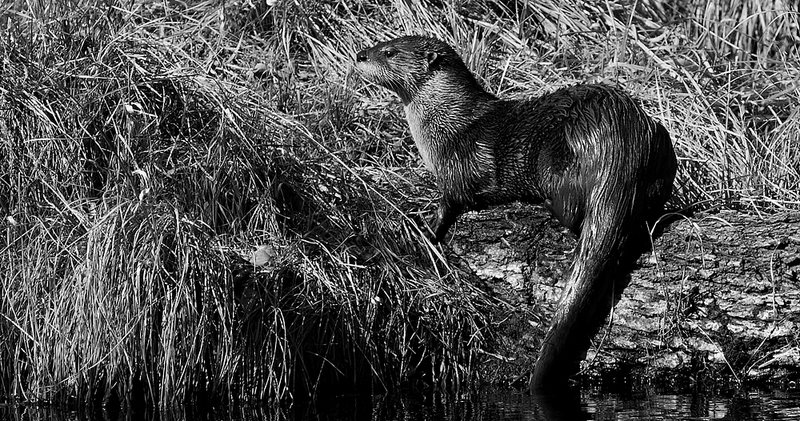 I got off the trail away from the waterway to get ahead of the otter and waited for it to approach. The area I selected was just below where Turkey Creek drains into the Fish Lakes. I backed up into the branches of a large cedar and after about 20 minutes I was rewarded. Much to my amazement one of the otters came ashore on the other side of the waterway not 30 feet away. 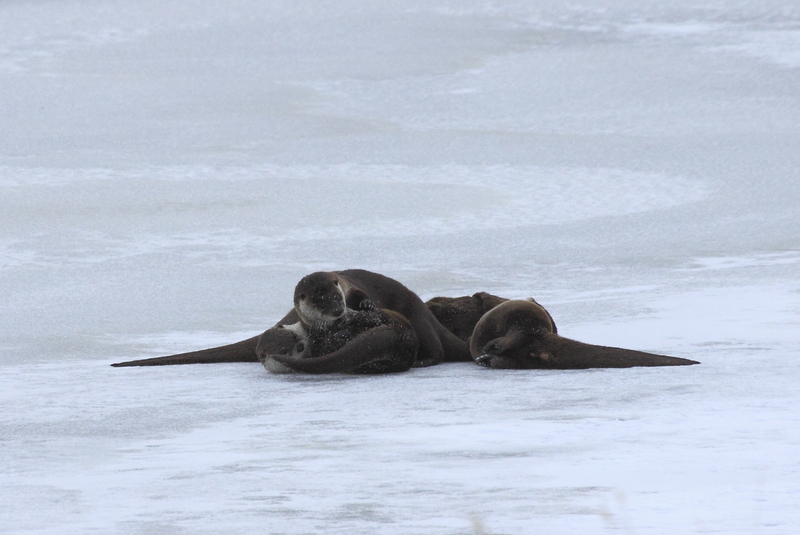 3 smaller otters entered an old beaver den as the adult relaxed on shore right next to the den. The sound of my shutter finally spooked the otter enough to go into the den too, but not before I captured her sitting on a log. That shot was my 1st award winning pic. I later discovered the adult was a one eyed female well known to one of the biologists. The next year I would photograph her again at Lost Lake. 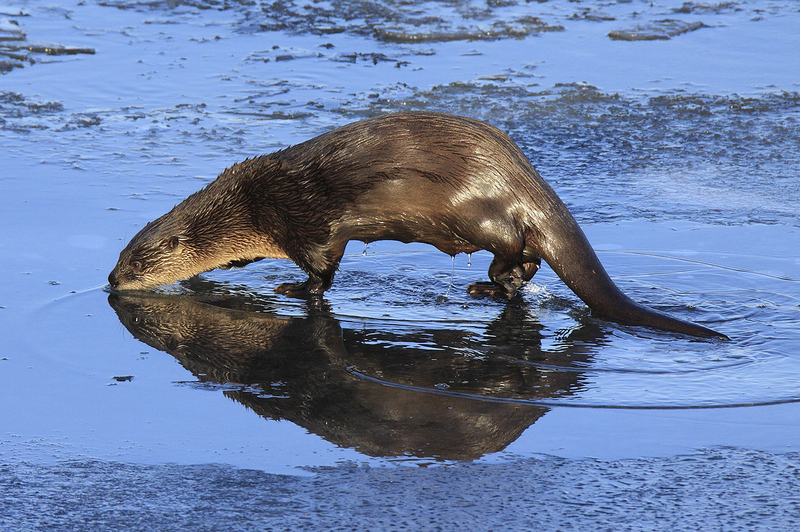 In December of 2013 I spent two days following 3 river otters at Caddo Lake. I would arrive right before daylight and get as close as possible without spooking them. I didn’t take a pic until the last few minutes of the second day hoping they would allow me to get close once I wanted to start shooting. At the end of the second day I pushed the envelope and got very close to a rock next to the dam they loved to get on after catching fish. The first few seconds of this encounter I thought I’d failed. Two otters swam to the rock, one of them got on it, heard my shutter, and stared at me. The second otter just stayed in the water not sure what to do. After another few seconds they both left. 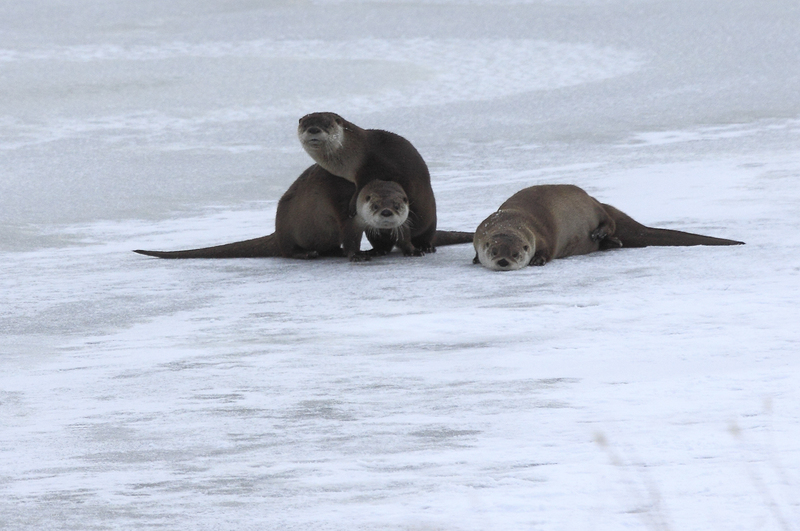 But after a few minutes the otters returned! The two with fish climbed up and started eating. My experiment worked! 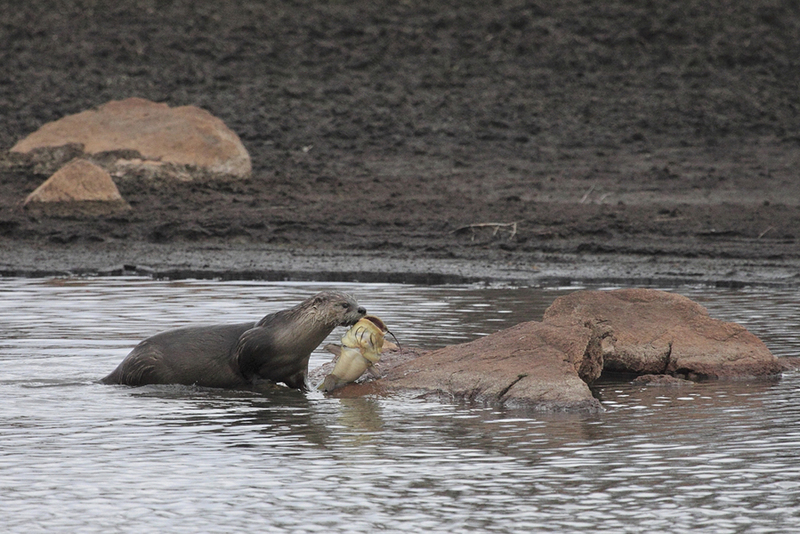 After they finished off the fish I walked away with some very nice pics! 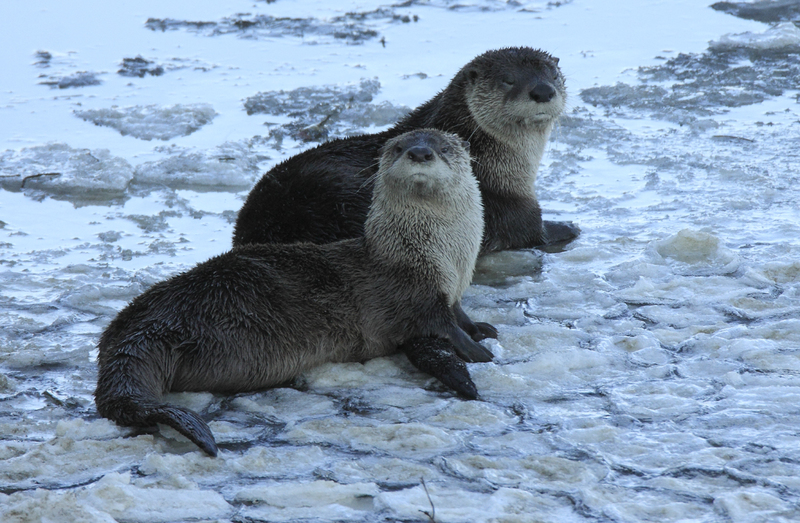 In February of 2015 I was able to find river otters on the ice at Crater Lake. I drove to Crater Lake before daylight, and could hear them playing on the ice. I got my gear and hiked down below the dam and up to the other side of the lake (behind the large slab of rock the lake plaque used to be attached to before it was stolen). By the time it was light enough to take any photos, I was already very cold and ready to return to the warm car. I was so close to them, but couldn’t move around or stomp my feet to generate any heat. They could hear my shutter, but all that was visible was my lens, and part of my head and arm. So they weren’t alarmed and seemed to take an air of casual indifference. The sun finally rose above the mountains to the east and brightened things up. It was Groundhog Day and the otters saw their shadow. We defiantly had another 6 weeks of winter! By the time I got back to the vehicle I wasn’t sure I would ever get warm again. I plan on doing more blogs that are species specific in the future. Let me know what you think.